Artificial intelligence (AI) tools are widely used today in many areas, and are now being introduced into scholarly publishing. This article provides a brief overview of present-day AI and machine learning as used for text-based resources such as journal articles and book chapters, and provides an example of its application to identify suitable peer reviewers for manuscript submissions. It describes how one company, UNSILO, has created a tool for this purpose, and the underlying technology used to deliver it. The article also offers a glimpse into a future where AI will profoundly change the way that academic publishing will work. News and media articles are today full of references to artificial intelligence (AI), and indeed AI is already more pervasive than we might notice. It is in daily use around us; this is not the future, this is the present. When we open our e-mail, AI is used to remove spam from our in-box. When Amazon or Spotify suggests ‘more like this’, it is using AI tools to identify likely suggestions. And when we complete a form using handwritten characters and numbers, an AI tool is typically converting our handwriting to machine-readable symbols. All these capabilities come under the heading of artificial intelligence, but this broad term ‘AI’ actually covers a wide range of different tools and approaches. The tools used in AI today are something of a return to ideas that had been created many years ago, notably Bayesian reasoning (explained later). While the principle of AI has remained constant – using a machine to solve problems that humans currently solve – the approach has varied. In the last 50 years or more there have been several shifts in direction for what constitutes AI orthodoxy. For many years, AI was based around what has been named as a symbolist approach (see, for example, Wikipedia, ‘Symbolic artificial intelligence’),1 trying to use pre-existing knowledge and combine it in the form of rules to solve problems. (See, for example, Domingos. )2 After all, this appears to be how humans reason: I know what I am looking at is a dog because it has four legs, and it barks. Yet, other animals have four legs, and wolves and foxes bark. In practice, the attempt to distil rules and procedures from observation turns out to be far more complex than anticipated. Imagine how many rules you would need to create to differentiate dogs from any other animal and achieve 100% accuracy. To create a perfect rule requires a complete knowledge of a domain, and for many tasks, including academic publishing, there is no complete knowledge available; we have to work from partial data. Academic publishing is based on language, and researchers have struggled for years to make natural language, the language humans write and speak, intelligible to machines, by codifying it into rules. AI researchers tried to replicate the workings of the human brain in order to determine what they presumed were the universal rules of grammar. But the results were poor; however large the grammar, there always remain the exceptions of natural language, which appear to be infinite. Trying to formulate the rules by which the universe is run is as complicated as running the universe. Modern AI is to a large extent based on a change in direction on the use of AI and machine-learning tools that became widespread during the last 20 years or so. It is based on a fundamental change to problem-solving. Instead of attempting to create rules based on a full knowledge of the problem, modern AI, which covers a vast range of solutions such as self-driving cars, forecasting the weather, online dating and image recognition, starts from a position of imperfect knowledge. Using what knowledge is available, it employs inference engines, which use existing data to predict new results, and combines those results with such techniques as neural networks, which ‘learn’ by assessing examples. These examples may be tagged (as when the computer is trained to identify handwritten numbers) to create a training set (as when a computer is provided in advance with 1,000 images of dogs and cats) or even, in the specific use described here, the machine trains itself: this is what is described as automatic or unsupervised concept extraction. Neural networks are frequently combined with Bayesian inference. Instead of attempting to collect all the possible relevant data, which would take significant time and may in any case be impossible to achieve, Bayesians start from a position of imperfect data and estimate a probable result based on the available information. It is not surprising, therefore, that Bayesian reasoning is used to try to determine likely odds for sporting events and in gambling3 – both cases where we are trying to predict an outcome using the available information. Bayesian reasoning provides a way of determining the probability of something when full background information is not available – such as predicting the future. It provides a remarkably wide-ranging set of solutions to many business problems. What is described here is the application of Bayesian reasoning to solve some of the common problems encountered as part of the academic researcher user journey. This involves working with academic text to provide various tools that enable the text to be ‘understood’. The AI discussed in this article is very different from traditional symbolist methods. Not only is it based on Bayesian reasoning, but it also makes use of unsupervised machine learning. Instead of starting with rules, unsupervised machine learning starts with nothing more than a corpus, which is just a large collection of textual content, for example book chapters or academic articles. Every word, or phrase, in a document is logged by the system, from its position within a sentence and within the document, so that words that are positioned nearby in the same sentence and within a few words can be identified. Simply by looking at the text in the context of all the other texts, a system can determine semantic information about words. For example, the phrase ‘cardiac arrest’ occurs in English language sentences in similar contexts to the phrase ‘heart attack’, and this is a powerful indicator of synonymy. Given a sufficiently large corpus of natural language, the system identifies these related meanings without any prior training in medicine, or indeed any other subject. What are the benefits of such an approach? One implication of this technique is that no prior subject tagging of the corpus is required. This technique does necessarily need a training set – a set of articles that have previously been coded to identify the required result. Nor is it necessary to begin by building a taxonomy, which would be the traditional approach to ‘understanding’ an article for identification purposes. Clearly, this is a dramatic change to more traditional approaches to coding content. UNSILO was founded in 2012 to bring AI-based solutions to the world of academic publishing, using the technology of ‘unsupervised concept extraction’. Co-founder Mads Rydahl had been product director of Siri, the San Francisco-based pioneer voice-recognition company that was subsequently bought by Apple. Similar technology is in use with all the leading software companies, Amazon, Microsoft and Google, although these companies have of course a much wider range of use cases than academic publishing. General AI tools tend to have lower quality results than software that is created expressly for one sector. In fact, academic publishing is an ideal area for this new concept extraction technology. Firstly, it comprises a very precise and well-structured subset of natural language, particularly in the case of journal articles and academic monographs; academic articles typically have an abstract, a discussion, a set of assertions and a set of references, for example. Although the language type is consistent, the quantity of content is vast, in fact so great that no human researcher can keep up with the continuing flow of content; around three million new articles are published every year.4 As academic publishing expanded dramatically during the post-war era, it required a scaling of the publishing model that many smaller publishers struggled to keep up with. Moreover, although some areas of academic publishing have existing standard classification systems (for example MeSH, the most widely used system for classifying medical articles), there is no standard classification system in use across all subjects. UNSILO’s first customer, Springer (subsequently Springer Nature), used UNSILO to identify links across all eleven million journal articles they published. (The number of articles is considerably higher today.) That use demonstrated two of the key advantages of this technology. Firstly, it is scalable, since it is able to employ both cloud storage for collection and manipulation of concepts. It takes advantage of the vast increase in computing power during the last 20 years to make it possible to analyse a corpus of some ten billion words and to capture information on every one of those words. Secondly, the subject-agnostic nature of the technology meant that a publisher such as Springer could use one tool to index all their content in a consistent way, ranging from molecular biology to business studies and economics. Finding related articles provides a quick win for the publisher: it can be delivered via an application programming interface (API) on the publisher or hosting company website, and so requires minimal work at the publisher end. It does not require any knowledge of AI to implement, and so provides an immediate benefit to users. Even though some subject areas at Springer had a taxonomy, there was no taxonomy that covered all the 25 or more subject areas in which Springer publish, hence the value of a subject-agnostic tool. AI: just another new technology? Undoubtedly, AI is a disruptive technology; it has the potential to transform many existing business processes because of its fundamentally different approach. Consider the invention of the typewriter: although it made the process of capturing text much more rapid and more efficient, it did not introduce any fundamental change in the way that an author creates content. By contrast, the AI tools described here enable some fundamental changes in the academic publishing workflow. For example, the concept extraction process can be used not just for document discovery and linking of content, but also for tasks involved in the manuscript submission process for scholarly articles. UNSILO presented at the 2018 Frankfurt Book Fair a set of automated checks (being tested with Clarivate and their Scholar One product) that help a human editor or author assess and evaluate a new submission in real time. Currently, the average time for peer review of a new article is in the region of three months.5 In addition, it is a very labour-intensive process. Around 75% of manuscript submissions are rejected before peer review, and typically three peer reviewers will be contacted for every published article, as documented by the recent Publons report on the state of peer review.6 While the number of peer review invitations is growing by around 10% per year, the number of accepted invitations is only growing by some 5% per year – clearly, it is a challenge finding good peer reviewers. Using unsupervised concept extraction, UNSILO provides an automated peer reviewer finder (Figure 1). Using the automated concept extraction process, the system builds a profile of a submitted article and compares it with the profile of the tens of thousands of published authors – in this case, the collection of open access full-text articles and abstracts available in PubMed, over 29 million articles.8 It then identifies the closest five matches of potential peer reviewer by creating a profile for each author based on the articles he or she has written and identifying the most relevant concepts for those articles. The human editor now has a list of suggested reviewers to contact, but there is no obligation for the editor to make use of all or any of the recommendations. In other words, the machine facilitates a human process, but in no way replaces the human input. Using the same technology, any submitted article can be matched to the most relevant of the 27,000 journals that comprise the PubMed collection (Figure 2). These are examples of how AI transforms the type of human engagement required for academic publishing. Further use cases are emerging as publishers engage more with the tools. Until now, publishers and institutions have responded very slowly to the use of AI. There may be several reasons for this. Publishing is an industry that has been slow to innovate (even today, the take-up of XML workflow is by no means universal across the industry, and the adoption of a standard XML ‘flavour’ is relatively recent, whereas the use of XML in other sectors, such as the transmission of financial transactions in banking, has been a standard for many years). At the same time, the industry has been cautious about the idea of editors losing control of any aspect of the submission process. As for libraries, they also have not engaged very systematically with AI tools as described here despite the great opportunities provided by them, for example in linking an institutional repository or preprint collection to the catalogue of published materials available via the university library. As a genuinely interdisciplinary tool, unsupervised concept extraction works across subject disciplines and covers any kind of textual content, including preprints and internal documents. Clearly, technology alone does not create innovation; it requires humans who see the possibilities and who can identify business cases from that technology. That combination of technology and human knowledge of specific publishing situations requires a working knowledge of both the use and deployment of these tools. In academic libraries, just as in publishing, some shared knowledge is required for a business case to be identified and accurately assessed. 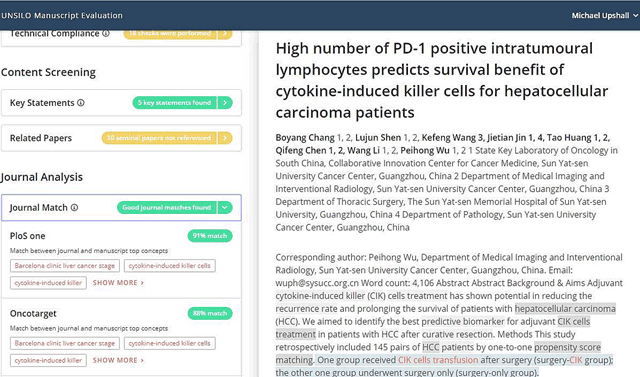 One way to encourage technical innovation is by the use of simple APIs that can be integrated to existing platforms, for example to indicate related content or to find a relevant journal. These APIs require minimal technical knowledge to install but can provide valuable information on user interaction with AI tools, while being at the same time fully justified as an investment in their own right. In this way, the publisher engages with the technology without having to have a detailed knowledge of the principles of AI and machine learning. Following the implementation of AI tools, can we therefore expect to see editorial departments reduced to zero staff in the future? Absolutely not! One of the first discoveries UNSILO made when implementing this technology is that those in control of the process want, quite rightly, to retain a level of human configurability, apart from some simple low-level tasks that can be entirely automated. An effective strategy for the implementation of machine-learning tools should respond to this request and provide a level of configurability, so a human editor or author can verify the process is delivering good results before leaving the algorithm to automate a process. But there is another fundamental reason for including humans. They are essential because AI is not value-free; there is bias in every algorithm. Humans, however, can identify and can counteract bias. Bias is ubiquitous in any human decision-making. To give one trivial example, a peer-reviewed academic study found that in the presentation of choices to humans, there is a bias towards choosing the first option in any survey.9 So it is not surprising that in any algorithm there is likely to be some bias. Of course, machine-based systems incorporate human bias, and using only human-based tools will not remove it – bias will still be found in the existing non-AI workflow tools currently in operation. The only way to deal with bias is to recognize, in any effective AI-based strategy, that bias from human decisions exists, and apply tools where possible to counteract it. In this brief overview I have suggested some of the ways in which AI tools could profitably be employed by publishers and institutions. The recommendation is for editors and information specialists to get hands-on experience at the earliest opportunity, enabling them to make future decisions on the rollout of the technology based on experience rather than guesswork. The peer-review solution presented here represents just one way in which AI tools could be deployed to deliver the goal of a faster and higher-quality academic publishing workflow. In the longer term, this AI-based technology will profoundly change the way that academic publishing works. For example, there is no reason why the submission tools discussed here could not be used direct by authors to try out their manuscripts for submission readiness. Publishers and institutions should be evaluating and implementing solutions using these new tools. The most effective implementation will come from experienced users able to identify the most effective points in the academic workflow where these tools can be introduced. “Symbolic Artificial Intelligence,” Wikipedia, February 14, 2019: https://en.wikipedia.org/w/index.php?title=Symbolic_artificial_intelligence&oldid=883217410 (accessed March 5, 2019). Pedro Domingos, The Master Algorithm: How the Quest for the Ultimate Learning Machine Will Remake Our World (London: Allen Lane, 2015). Nate Silver, The Signal and the Noise: The Art and Science of Predictio (London: Allen Lane, 2013). Rob Johnson, Anthony Watkinson and Michael Mabe, The STM Report 2018: An Overview of Scientific and Scholarly Journal Publishing (2018): https://www.stm-assoc.org/2018_10_04_STM_Report_2018.pdf (accessed March 5, 2019). “Publons Global State Of Peer Review-2018”: https://publons.com/static/Publons-Global-State-Of-Peer-Review-2018.pdf (accessed March 5, 2019). “PubMed,” Wikipedia: https://en.wikipedia.org/w/index.php?title=PubMed&oldid=877177825 (accessed March 5, 2019). Dana R. Carney and Mahzarin R. Banaji, “First Is Best”, PLOS ONE 7, no. 6 (27 June 2012): e35088: https://journals.plos.org/plosone/article?id=10.1371/journal.pone.0035088 (accessed March 5, 2019).